The first Welcome to Night Vale original novel was an interesting little adventure that managed to build on some of the mythos of the podcast without relying too heavily on knowledge of all the stories that had come before. Reviews for that book were largely positive with most criticism tied to the references to the podcast being too many or not enough depending on the person. It Devours! is the second such original book and once again it puts us in the shoes of two particular Night Vale citizens. This book felt like it managed to get a lot closer to the "core" cast of the podcast, as it were, as many notable figures played key roles in the larger narrative. In addition, it also tied to some of the more significant events in Night Vale history that would be instantly recognizable to fans of the show. I think the book still stands on its own well enough though even if you never listened to the show as it managed to describe in detail a lot more about what the characters were facing. In addition. a lot of the book focuses on something that had largely been mentioned repeatedly but without significant detail, so that still provided more information for fans new and old. 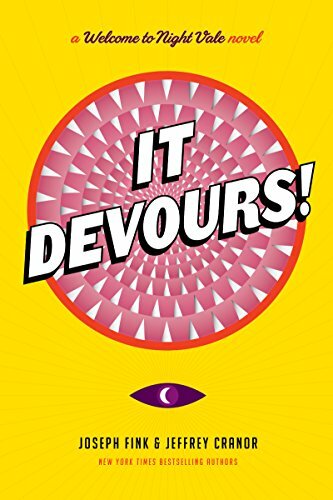 Synopsis: It Devours! is the second original Welcome to Night Vale novel also written by show creators Joseph Fink and Jeffrey Cranor. A large focus of the book is cult of the Smiling God, which has played a role in many WTNV stories. Nilanjana Sikdar is a scientist who has somehow moved to Night Vale to work with Carlos, the scientist. At the start of the book her area of focus involves creating better pesticides while Carlos remains focused on finding ways to study that other desert wasteland that he had once been trapped in. In contrast there's also Darryl, one of the most devout members of the Congregation of the Smiling God. He faithfully tries to get more people to join their rather unique religion but struggles with expressing himself in a way that doesn't come across as sarcastic or downright creepy. Things get weirder than normal in Night Vale when entire houses start to disappear into what can only be described as giant sinkholes. At the same time the City Council has issued stronger warnings to Carlos not to investigate the other world any further. This leaves Nilanjana to investigate the missing citizens of Night Vale and this somehow leads her to taking a closer look at the Congregation of the Smiling God. What I Liked: As much as the Smiling God had been repeatedly mentioned in the show, it was always this big other thing without much definition and fans of the show only knew the general shape of it. This book found a way to have the odd religion at the center of a larger plot in a way that was quite fulfilling on different levels. And while mid-way through the book it may seem obvious how things would tie together in the end, you're still going to be surprised by the final outcome. It's also oddly refreshing to experience the quirky natures of different prominent Night Vale characters in a new way as we're not limited to how Night Vale Radio host Cecil Baldwin would describe these characters. And to this end I appreciate the third person narrator that helps tell the story as this gives us a new way to experience this quirky world. And Nilanjana Sikdar is an amazing character who is intriguing for a number of reason, but the one that stands out the most is the fact she is somehow from outside of Night Vale. This gives her a largely more logical stand on things, which oddly contrasts what Carlos has become given his years in Night Vale. What Could Have Been Better: I will concede that a lot of my enjoyment of this book stems from being a Night Vale fan and I can only imagine how confusing the book may feel given references to magical doors leading to a desert other world or even just the mysterious hooded figures that are seen around the dog park that does not allow dogs or any other visitors. There's still enough to keep the story afloat on its own but the setup can be a little confusing. The final resolution to things was certainly a surprising twist but depending on how you followed things it can feel totally left field or logical enough. I was a little on the fence about how we got to that conclusion as it did make sense in the end but it also felt that the essential clues that led to that conclusion came at the last possible minute. And as the larger structure of the book was more like a mystery, that naturally has readers like me wanting to feel like there's a chance to figure things out or at least follow the protagonists' scientific study to reach the same logical conclusion. 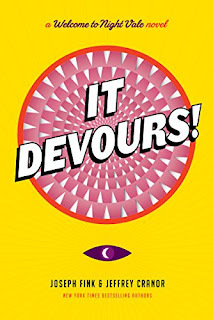 TL;DR: It Devours! is still a great book and in many ways it felt more narratively strong and fulfilling versus the first book. The book focuses on some pretty interesting characters and I hope that we see them more often in other Welcome to Night Vale media. Thus the book gets a full 5 straight occurrences at the outskirts of Night Vale out of a possible 5.